How can I reduce free space between under the juicebox galleries on my website - vasilyiakovlev.com ? Maybe it's possible to align the footer to the bottom of the page irrespective page body hight? But the best solution can me moving footer to the right-top edge of the page. Maybe is that possible?? And one more question - can I change icons in the footer to the color ones? I have changed icons by IcoMoon App to coloured, but on my website they are still B&W. Here are some suggestions which may help. 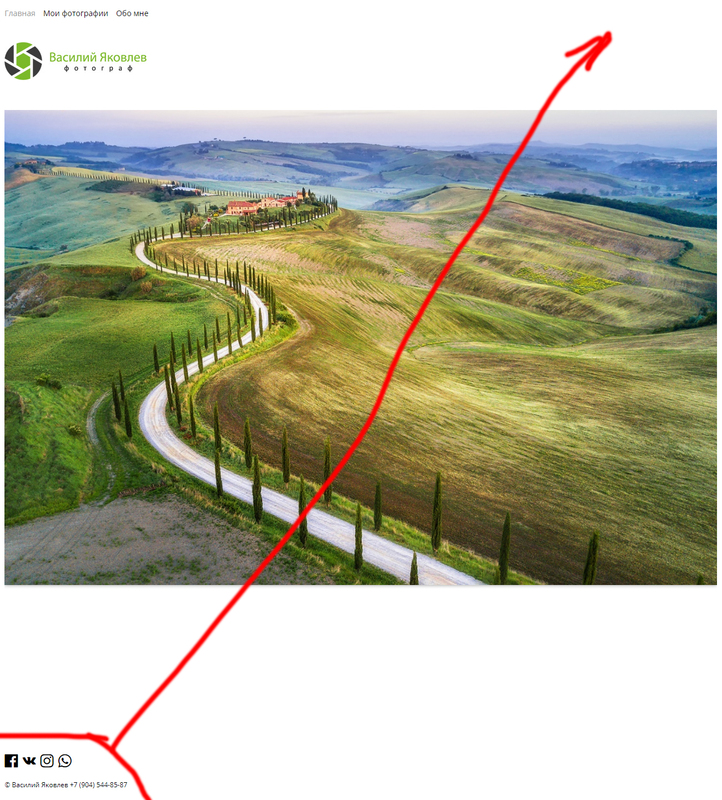 I notice on your gallery page that there is no content in your page body (no page title or body text) and, as you have set 'Show gallery -> Above page content', there is an empty container (with a small height) below your gallery. If you want to remove this empty container from your page, then you can do the following. The page number in your case (in the line of code above) is 1. ... changing the page number as necessary. This will certainly remove some space between the bottom of the gallery and the footer but you may still need to scroll down to see the footer. You can reduce the height of your gallery by editing your page, scrolling down to the 'Override Site Options' section and entering a negative value for 'External fit px' (and then clicking 'Save' and 'Publish'). This will reduce the height of your gallery by the number of pixels you enter (e.g. "-200") and your footer is more likely to be visible without the need for vertical scrolling. This would not be easy. It is not a layout that can be chosen within the Showkase interface. The footer is always at the foot of each page. The navigation container spans the width of each page. You'd need to somehow add the footer content to the navigation container (without affecting Showkase's handling of the navigation) or change the layout of the page (neither of which would be quick or easy to achieve). And one more question - can I change icons in the footer to the color ones? As long as each icon has only one color associated with it, then perhaps the easiest way to change the footer icon colors would be to assign a color for each icon via CSS in the appropriate 'styles.css' file (depending on the theme you use). Please note that the line number above refers to the current version of Showkase-Pro (v1.7.4). Thank you very much Steven! I will try. Thank you. I hope you get on OK with my suggestions.